Nyewood Lane was a grim place to be after Bognor conceded two goals in each half to lose 4-0 to Leatherhead - their second home loss by that margin in just over a month. The bosses are refusing to use their horrendous injury list as an excuse and said the performance simply wasn’t good enough – and warned that efforts in the final six league games, as well as the Sussex Senior Cup semi-final, had to be significantly better. Pearce and Blake have told the players to show they DO care about the club - something Blake said was not obvious from some in Saturday’s defeat. The Rocks head to Wingate & Finchley on Saturday eight points off the top five, with hopes of gatecrashing the play-offs now very slim - there are only six games to go. But the team won’t be allowed to go through the motions and play out the season. Hopes of an upturn in fortunes continue to be hit by injury setbacks - particularly at the back. One centre-half, Harvey Read, may be fit to return after a groin problem but another, Chad Field (who had been the only central defender on the club’s book not to suffer an injury this season) is a doubt after coming off during the Leatherhead loss with a hip injury. 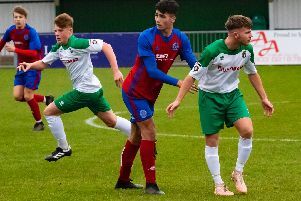 Meanwhile Baffins Milton Rovers left-back Ashton Leigh and ex-Worthing attacker Reece Meekums both earned praise for their Bognor debuts on Saturday. And with the likes of Joe Tomlinson, Calvin Davies and Jimmy Muitt not yet ready to return, they are likely to be involved again at Wingate. Pearce reflected on the Leatherhead loss and said: “I can understand fans’ frustration more than anyone. I’m a fan too and it’s just as frustrating for me. Against Leatherhead the opposition showed more desire to get to the ball first. They were aggressive and well-organised and we didn’t have enough ammunition to deal with them. Tanned by Tanners - is play-off dream over? “There were important moments that went against us, like when we hit the bar and then the post, but we keep conceding goals late in halves and some of them are down to basic defending mistakes. “Our injuries do make a difference – we have had four centre-halves out for four months or more this season and now another two have picked up injuries – and I did feel when we lost Jimmy Muitt to injury and Dan Smith to another club on loan in the space of a week, our serious chances of getting in the play-offs and going up had been swamped. “I defy any club to lose 40 goals out of their squad and cope. Anyone who thinks we can overcome that and all the other injuries we’ve had is living in cloud-cuckooland. But we can’t change it and now we need to get on with what we have. “I wish I’d seen more battling qualities from us on Saturday but our players, like the fans, are deflated. The atmopshere at the club isn’t good. Coach Blake was as forthright as ever about Saturday’s loss. He said: “It wasn’t an acceptable performance but it is what it is. We’re a dejected and feeling-sorry-for-ourselves team at the minute and we’re a shadow of the team we were early on. “We’ve lost a lot of players like Jimmy Muitt and Dan Smith and when you take 40 goals out of your team, I don’t care what level you’re at, you’re going to be weakened. Since they have gone we haven’t won a game. “I’m not for one minute trying to make excuses because it wasn’t good enough (v Leatherhead). At 1-0 Brad (Lethbridge) hits the crossbar with a volley. If that goes in it could be a different game, although they bullied us. They did their homework, said ‘put the ball in the box, we can’t defend the ball in the box and we’ll concede’ and that’s what happened. “Even at 2-0 Mason hit the post and it might have been 2-1 and been a different game. There were a few decent performances in my opinion - people you can rest your hat on. Harvey Whyte will run through a brick wall for you, I thought Reece (Meekums) was very good, I thought Keaton was having a good game until his mistake. Chad Field, Doug Tuck, Mason Walsh – your usuals. Blake added: “When you’re stood there you think ‘I know what he’s going to do for me’ but there’s too many players out there for me - and I can’t speak for Jack - who I don’t trust. If you trust a certain person you can relax and know everything’s going to be all right but we’re not at that stage. “We’ve had to bring players in because – and I don’t want to go on about it - our injuries are nothing short of ridiculous. And when you bring players in at short notice and you can’t work on them that much it’s tough to get that cohesion and that shape you can work on. Blake said Walsh was outstanding against the Tanners and Meekums was excellent given that he had trained with his new team-mates only once. Can the Rocks still sneak into the play-offs? Blake said: “It’s not gone til it’s gone but we’ve given ourselves a mountain to climb. We have to roll our sleeves up now, this will be a test of character. Do we want to flit about in mid-table and end on a bad note or do you want to roll your sleeves up and take a game at a time and see where it takes you?